Heading out of Ecclesdown Road on the second day of my trip, I had nailed all of my targets save four species (Caribbean Dove, Yellow-billed Parrot, Jamaican Owl, and Stolid Flycatcher). I had a reservation to stay at Hardwar Gap for the night, previously thinking that I would need the extra full day to look for Jamaican Blackbird and Crested Quail-Dove, which I decided to honor. Other than paying a visit to the beautiful Frenchman’s Cove and Blue Lagoon for some photographs of the tropical paradise-like scenery and stopping at the Blue Cafe on my back up to the Blue Mountains for some curried goat and amazing chocolate rum cake, the drive back up the Blue Mountains was relatively uneventful. Between Section and Silver Hill Gap, I ran across Crested Quail-Doves numbers five and six for the trip. The Starlight Chalet itself had a swarm of swifts overhead in the fading light, and watching them fly between myself and the mountainous backdrop, I picked out both White-collared and Black Swifts. Well before dawn, I was already on my way back down the mountain enjoying the scenery and fresh air of the little traveled road. As the lush green forest gave way to drier vegetation, I ran into my first Caribbean Dove on the road. I would find these beautiful doves to be common at the feeders around Marshall’s Pen later in the day. The drive from Kingston to Mandeville was mostly along a very modern (albeit short) highway, and I was at Marshall’s Pen talking with Ann Sutton by around noon. 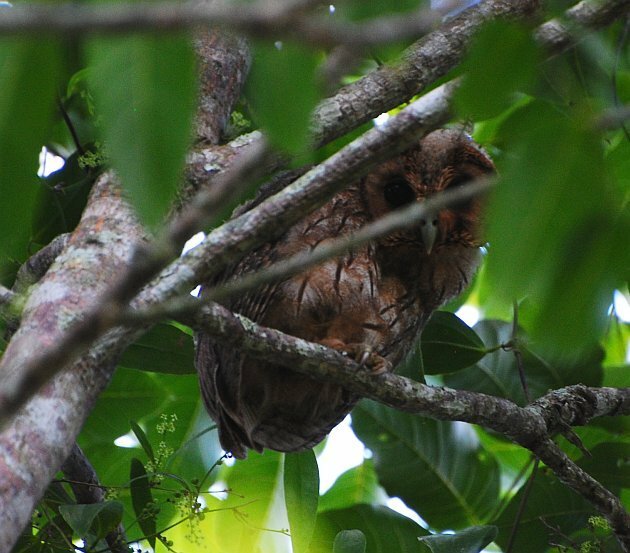 I told her that I had three target birds left to see, and she gestured at a tree near the guesthouse where three Jamaican Owls were roosting. The entire grounds of her property were extremely birdy. The feeders were decked with Yellow-faced and Black-faced Grassquits, White-eyed Thrush and Jamaican Oriole were making themselves busy around a fruiting tree, Chestnut-bellied Cuckoo and Jamaican Becard were calling incessantly from the wooded sections of the paddocks, and Vervain Hummingbirds and Jamaican Euphonias were singing away on the bare branches of small trees throughout. I took the day easy, going to the local supermarket for some snacks and ingredients for dinner. Tomorrow would be the day to pick up the parrot and the flycatcher, choosing Burnt Hill as the point from which to explore the Hill Country that morning. A Jamaican Owl peers down at me from a tree at Marshall’s Pen. Heading out again before dawn, I arrived at Burnt Hill at around 7:00AM but not without a bit of a GPS misadventure. Cockpit Country is littered with small roads that weave through agricultural areas as well as the main highway — the GPS pointed me in the direction of a newly paved road that became narrower and more pothole ridden as one continued along its length. The last 100 meters or so was basically rock with a steeply angled (read: small cliff) section that connected to a paved portion. Being stubborn and with no real way to turn back, I adjusted the gears on my little rental vehicle and zoomed up onto the paved road and back on track to my destination. The karst scenery of Burnt Hill was dramatically different from anything I had seen yet on Jamaica. Here, Jamaican Tody was absolutely abundant and the calls of unseen parrots echoed throughout the valleys. At first, only Black-billed Parrots showed but I eventually had a distant pair of Yellow-billed Parrots followed by many more individuals that gave me both perched and close in-flight views. On my way out, a Stolid Flycatcher was calling a bit of a ways down a valley. With quick use of the tape and a short burst of song, I had an immediate response and got to observe this flycatcher at length — the call is quite different from that of the closely related Bahamas race of La Sagra’s Flycatcher which I have heard in southeast Florida. Having seen all my targets, I slowly made my way to Elim Pools west of Mandeville to see some wetland species, which included a small flock of West Indian Whistling-Ducks along with more regular species for the location such as Northern Jacana, Limpkin, and Purple Gallinule. It was threatening to rain, and as I made my way back to Mandeville, I noted how badly the streets in Jamaica flood during any sort of rain event — the streets turn into defacto rivers! 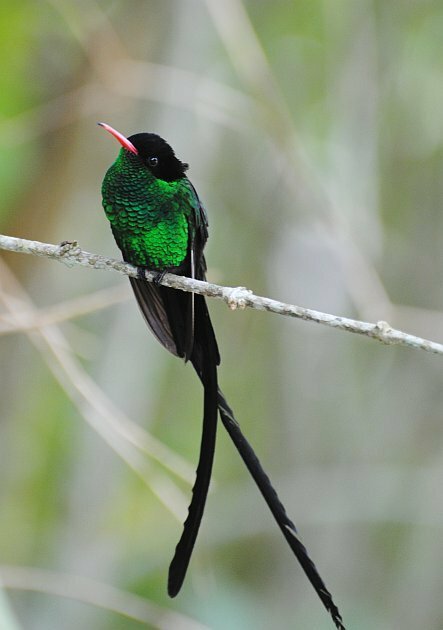 Streamertail is a spectacular and abundant endemic species of Jamaica, locally known as the Doctorbird. Arriving back in Mandeville, I had finished the serious birding portion of my trip. The only goal left was to take a good photograph of a male Streamertail, Jamaica’s most iconic endemic bird, before I left. Amazing, Carlos. I’m jealous that you got to meet Ann Sutton and bird Cockpit Country! Man, what a trip. 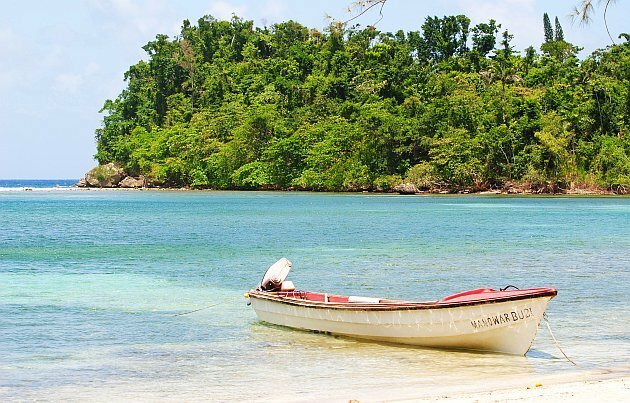 Jamaica just sounds fantastic!